Amazon coins can be a great way to save a decent amount of money on your apps, games and in-app item purchases. It's becoming increasingly popular and we'll show you how to make the most out of them and what are some things that you need to take note of before you decide to but them. So before we go further on how you can buy or earn Amazon Coins and what you can buy with Amazon coins, it is probably good to explain what Amazon Coins are. Basically, Amazon Coins is a currency you use to buy eligible apps, games, and in-app items. 100 coins are worth $1 and you can get a discount for buying in bulk, which allows you to save up to 25%. The coins come in denominations from 500 to 50,000 and you save more as you buy the bigger denominations. The Amazon Coins you buy never expire. You can then spend your Amazon Coins like you would cash, through either the Amazon Appstore or in-app items like gems and power-ups. Amazon does not collect tax on the purchase of Amazon Coins. Taxes may apply when Coins are spent. With the fairly recent Digital Goods Sales Tax that's applicable in 28 states at the time of writing, you will need to factor in the applicable sales tax to see if it makes sense for you to transact in Amazon coins. I'll explain this in greater detail with some real life example Amazon Coin transactions further down. So now that you know what Amazon Coins are, how can you get your hands on them? Well there are three main ways you can acquire some for yourself. Probably the most common way that people get started with them is to simply buy them from Amazon. Another way to get Amazon Coins is to earn them. You can earn free Amazon Coins when you buy eligible apps, games and in-app items through the Amazon Appstore. It's important to note that this only applies to selected apps and that you need to purchase the app through the Amazon Appstore and not through the Google Play Store or equivalent. Do remember to check the titles currently featuring Amazon Coins back reward from time to time. Download the Amazon Appstore app but remember it is separate from the normal Amazon app. Amazon typically offers discounts when you buy the coins and there's usually a bigger discount when you buy more coins. Life gets even better though. Amazon always gives a discount when buying coins. So, for example, you can buy $100 worth of coins for $88. Sometimes, Hearthstone will also run a promo on Amazon, so that when you buy your packs using Amazon Coins, you will get a refund in coins. Then, when you buy packs with those coins, you get a refund in coins. This is like stacking two "discounts" on top of one another. 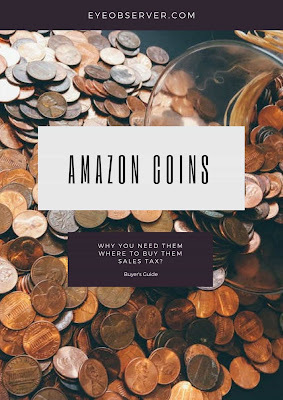 One of the points of contention that always comes up when comparing using Amazon Coins versus buying from the Google Play Store is the digital sales tax that has been implemented in a number of states. First off, let me state clearly that there's no tax when you buy Amazon Coins. There might be a tax, however, when you spend those coins on digital goods. The taxation of digital goods is a grey area. Some states have implemented new laws or are relying on general tax laws to tax digital goods. Alabama, Arizona, New Mexico, Utah, West Virginia, Indiana, Louisiana, Maine and Texas rely on general tax laws to tax digital goods while Colorado, Connecticut, Idaho, Kentucky, Nebraska, New Jersey, South Dakota, Tennessee, Vermont, Washington State and Wisconsin have enacted laws specifically for taxing digital goods. On the other hand, there are states which expressly do not tax digital goods or have left the rules open for interpretation. North Dakota and Washington D.C. are two states that expressly do not tax digital goods. 5 states do not have any retail tax at all - Alaska, Delaware, Montana, New Hampshire and Oregon. The way the sales tax has been implemented by the two companies is slightly different. With Amazon Coins, the digital goods tax is imposed depending on the buyer's address. If you're residing in a state which requires a sales tax on digital goods, then you'll be taxed (in Amazon Coins) when you purchase an app or make an in-game purchase. Google on the other hand seems to implement the tax based on the domicile of the seller. So if the Game maker is domiciled in California, which doesn't have a digital goods sales tax, then you wouldn't be hit with a sales tax when you purchase your app or in-game item. Depending on the state and the type of digital good, the digital goods sales tax varies from 1% to 7%. So to make a decision on whether it makes sense to make your purchases using Amazon Coins, you need to know what the taxes are regarding digital goods in your state are. If the discount you get from buying Amazon Coins is higher than the sales tax rate, then it makes sense to transact in Amazon Coins. Let's say you get a 25% discount for buying $500 worth of Amazon Coins. If you're hit with a 6% tax after buying your in-game item like a deck of Hearthstone cards, then your net gain is still roughly 19%. On the other hand, if you only get a 2% discount for buying $10 worth of coins, that wouldn't be worth it with the digital sales tax. I hope you've gained a better understanding of what Amazon Coins are and how you can take advantage of them - especially when you buy in bulk or stack them with running promotions on Amazon. Also want to emphasize that it's very important you know what the taxes on digital goods are for your state. Quaderno has a good run down on the taxes for each state. If the discount on the coins is greater than the sales tax for your state, it is worth buying using Amazon Coins. In full disclosure, there are affiliate links in the article above. Thank you for supporting us all these years and we couldn't have done it without your help.